Dec. 30, 2011: NASA's twin GRAIL spacecraft, on a mission to study the moon's gravitational field, are nearing their New Year's Eve and New Year's Day main-engine burns to place the duo in lunar orbit. Named Gravity Recovery And Interior Laboratory (GRAIL), the spacecraft are scheduled to be placed into orbit beginning at 1:21 p.m. PST (4:21 p.m. EST) for GRAIL-A on Dec. 31, and 2:05 p.m. PST (5:05 p.m. EST) on Jan. 1 for GRAIL-B. "Our team may not get to partake in a traditional New Year's celebration, but I expect seeing our two spacecraft safely in lunar orbit should give us all the excitement we need," said David Lehman, project manager for GRAIL at NASA's Jet Propulsion Laboratory (JPL) in Pasadena, Calif. The distance from Earth to the moon is approximately 250,000 miles (402,336 kilometers). NASA's Apollo crews took about three days to travel to the moon. Launched from Cape Canaveral Air Force Station Sept. 10, 2011, the GRAIL spacecraft are taking about 30 times that long and covering more than 2.5 million miles (4 million kilometers) to get there. This low-energy, long-duration trajectory has given mission planners and controllers more time to assess the spacecraft's health. The path also allowed a vital component of the spacecraft's single science instrument, the Ultra Stable Oscillator, to be continuously powered for several months. This will allow it to reach a stable operating temperature long before it begins making science measurements in lunar orbit. "This mission will rewrite the textbooks on the evolution of the moon," said Maria Zuber, GRAIL principal investigator from the Massachusetts Institute of Technology (MIT) in Cambridge. "Our two spacecraft are operating so well during their journey that we have performed a full test of our science instrument and confirmed the performance required to meet our science objectives." During their final approaches to the moon, both orbiters move toward it from the south, flying nearly over the lunar south pole. The lunar orbit insertion burn for GRAIL-A will take approximately 40 minutes and change the spacecraft's velocity by about 427 mph (688 kph). GRAIL-B's insertion burn 25 hours later will last about 39 minutes and is expected to change the probe's velocity by 430 mph (691 kph). The insertion maneuvers will place each orbiter into a near-polar, elliptical orbit with a period of 11.5 hours. Over the following weeks, the GRAIL team will execute a series of burns with each spacecraft to reduce their orbital period from 11.5 hours down to just under two hours. At the start of the science phase in March 2012, the two GRAILs will be in a near-polar, near-circular orbit with an altitude of about 34 miles (55 kilometers). When science collection begins, the spacecraft will transmit radio signals precisely defining the distance between them as they orbit the moon. As they fly over areas of greater and lesser gravity, caused both by visible features such as mountains and craters and by masses hidden beneath the lunar surface. they will move slightly toward and away from each other. An instrument aboard each spacecraft will measure the changes in their relative velocity very precisely, and scientists will translate this information into a high-resolution map of the Moon's gravitational field. The data will allow mission scientists to understand what goes on below the surface. This information will increase our knowledge of how Earth and its rocky neighbors in the inner solar system developed into the diverse worlds we see today. Dec. 30, 2011: When NASA's Dawn spacecraft entered orbit around giant asteroid Vesta in July, scientists fully expected the probe to reveal some surprising sights. But no one expected a 13-mile high mountain, two and a half times higher than Mount Everest, to be one of them. The existence of this towering peak could solve a longstanding mystery: How did so many pieces of Vesta end up right here on our own planet? For many years, researchers have been collecting Vesta meteorites from "fall sites" around the world. The rocks' chemical fingerprints leave little doubt that they came from the giant asteroid. Earth has been peppered by so many fragments of Vesta, that people have actually witnessed fireballs caused by the meteoroids tearing through our atmosphere. Recent examples include falls near the African village of Bilanga Yanga in October 1999 and outside Millbillillie, Australia, in October 1960. "Those meteorites just might be pieces of the basin excavated when Vesta's giant mountain formed," says Dawn PI Chris Russell of UCLA. Russell believes the mountain was created by a 'big bad impact' with a smaller body; material displaced in the smashup rebounded and expanded upward to form a towering peak. The same tremendous collision that created the mountain might have hurled splinters of Vesta toward Earth. "Some of the meteorites in our museums and labs," he says, "could be fragments of Vesta formed in the impact -- pieces of the same stuff the mountain itself is made of." To confirm the theory, Dawn's science team will try to prove that Vesta's meteorites came from the mountain's vicinity. It's a "match game" involving both age and chemistry. "Vesta formed at the dawn of the solar system," says Russell. "Billions of years of collisions with other space rocks have given it a densely cratered surface." The surface around the mountain, however, is tellingly smooth. Russell believes the impact wiped out the entire history of cratering in the vicinity. By counting craters that have accumulated since then, researchers can estimate the age of the landscape. "In this way we can figure out the approximate age of the mountain's surface. Using radioactive dating, we can also tell when the meteorites were 'liberated' from Vesta. A match between those dates would be compelling evidence of a meteorite-mountain connection." For more proof, the scientists will compare the meteorites' chemical makeup to that of the mountain area. "Vesta is intrinsically but subtly colorful. Dawn's sensors can detect slight color variations in Vesta's minerals, so we can map regions of chemicals and minerals that have emerged on the surface. Then we'll compare these colors to those of the meteorites." Could an impact on Vesta really fill so many museum display cases on Earth? Stay tuned for answers. More than 600 new light emitting diode (LED) lighting fixtures were installed on USS Chafee (DDG 90) during the ship’s recently completed availability, providing the ship with longer-lasting lights that use less electric power than the replaced incandescent and fluorescent light fixtures. The new fixtures have a minimum 50,000-hour lifespan compared to the 1,000-hour incandescent globes and 7,500-hour fluorescents. The ship is expected to save more than $50,000 per year using the new lights. USS Chafee is the first ship to receive all new lighting fixtures. In early 2012, USS Preble (DDG 88) is expected to receive the same fixtures, as well as LED bulb replacements for the ship’s two-foot fluorescent fixtures, which are the most common lighting on DDG 51 class ships. Savings are expected to exceed $100,000 per ship per year when the scope is expanded to include the T12 fluorescent fixtures in the backfit program. The Naval Sea Systems Command will continue installing the fixtures aboard in combatant and amphibious ships over the next several years as part of the Navy’s maritime energy strategy. Advancement in technology is rapidly enhancing the treatment of wounded warriors with psychological health and traumatic brain injury concerns. Defense Centers of Excellence for Psychological Health and Traumatic Brain Injury (DCoE) interviewed Dr. Skip Moe, National Center for Telehealth and Technology (T2) chief of staff, via the social media platform Twitter Dec. 13. Moe shared with DCoE an overview of the current technologies that are being worked on at T2, as well as highlighted a few future projects. "T2 leverages cutting edge technology and telehealth solutions to support service members, veterans and their families with issues related to psychological health and traumatic brain injury," Moe stated. "And by using social media, such as this first Twitter interview with DCoE, we are better able to make that audience aware of our products and resources." The discussion about mobile applications for use by service members, veterans, their families and health care providers was the trending topic of the afternoon. According to T2, mobile apps have two major benefits: they provide both education and convenience. There are currently mobile apps available by T2 for both the provider and the service member. The twitterview highlighted the Co-occurring Conditions Toolkit, the T2 MoodTracker and PTSD Coach. Future mobile apps include Life Armor, a mobile version of the popular post-deployment website afterdeployment.org, as well as apps based on building resilience for both the warrior and the provider. If you missed the DCoE twitterview you can still find the conversation on Twitter by searching #T2Health, or download the transcript here. DCoE is active on social media channels including Twitter, Facebook, YouTube and the DCoE Blog. T2 is also active on Twitter and Facebook. Develop one aircrew mask that can be used on over 100 different air frames. That is the challenge for researchers assigned to the Joint Service Aircrew Mask-Fixed Wing Program. Kevin O’Neal, a combat developer with the Air Force Air Combat Command, said the team hoped to hammer out a universal communications configuration for the mask and determine which hoses can be used for the breathing system. The 167th Aircrew Flight Equipment section hosted the JSAM-FW team as it worked with 167th Airlift Squadron aircrew members in each of the flying positions. Pilots, loadmasters and flight engineers donned the mask and accompanying equipment. They then performed various functions of their duty mission. Afterward, each Airman completed a questionnaire, providing feedback to the JSAM-FW team. Maj. Jeff Musser, a pilot with the 167th Airlift Wing, volunteered to participate in the assessment. He said the mask was definitely better than what aircrews are currently issued. Musser also noted that having a filter canister that can be changed to either side of the mask is a good feature for pilots who may sit in either the right or left seat of the cockpit. Tech. Sgt. Michael Lindamood, a loadmaster with the unit, also participated in the team’s evaluation and echoed Musser’s sentiments on the mask. As part of a Department of Defense modernization program to improve the current aircrew eye and respiratory protection, the JSAM-FW project falls under the Joint Services Joint Program Executive Office for Chemical and Biological Defense. Chief Master Sgt. Danny Effland, the section chief for the 167th Aircrew Flight Equipment section, said the JSAM will potentially replace the AERP. Effland was responsible for coordinating the team’s visit to the unit. Effland said with the M-53 Aircrew Chemical Biological Mask, all of that is eliminated. “Time, manpower and money are saved, and there’s probably better protection,” he said. The M-53 mask is part of the JSAM system. The M-53 works in the positive and negative mode. “Negative meaning on ground, and positive mode meaning we hook a blower up to it,” O’Neal said. The M-53 also integrates night-vision goggles and laser eye protection. The development of a joint air crew mask has been 10 years in the making. Initially, researchers were hoping to find one mask to meet the requirements of all aircrew in every branch of the military on all aircraft. The progress was slow due to the challenges of fitting aircrew for more than 125 airframes, Fletcher said. It was determined that finding a mask to meet all aircrew requirements was unlikely, so the program split into fixed wing and rotary wing aircraft, she added. There were still many challenges to finding one mask to meet all requirements for fixed wing air crew, but after discovering the M-53, a ground crew mask manufactured by Avon Protection, the program has catapulted forward, O’Neal said. Fletcher explained that preliminary testing proved the M-53 to be feasible for the joint mask criteria. After altitude chamber testing, a few changes were made to the mask, and now it looks like it may provide a cost savings in procurement and sustainment. Effland said it was an “awesome experience” to have the team come to the unit and conduct evaluations. “It’s great for the guys in the shop to see the behind the scenes of the equipment we issue and the steps it takes for the equipment to get here,” he said. Effland added that he might not be around when the JSAM and M-53 are standard issue for the aircrew, but some of the young Airmen will still be serving the unit. He said it will be great for them to know that they had a part in the process. Camtica enables you to create professional screen recordings, presentations, tutorials and more. 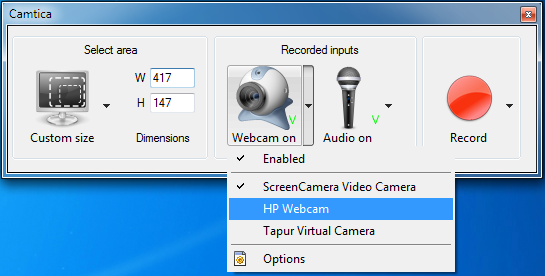 You can record any desktop activity with voice, webcam and animated mouse clicks. The resulting video can be saved in various formats including AVI and WMV. Why do you need Camtica? It’s easy to use as one, two, three. If you have any questions about our products, don't hesitate to ask them. 12/28/2011 - SCHRIEVER AIR FORCE BASE, Colo. -- One of the top New Year's resolutions through the years has been to lose weight or get fit. According to Time Magazine, it's also one of the top 10 most commonly broken resolutions. The Schriever Health and Wellness Center wants to help members get a jump on keeping this year's resolution by offering a friendly competition to cut the fat. The 50th Space Wing Bod Pod Competition pits squadrons against each other and the unit with the greatest percentage of lost body fat wins. Participants have two weeks beginning Jan. 1 to sign up at the HAWC and get their body fat measured in the Bod Pod body fat measurement tool. Teams have to have at least five people with one person qualified to use the Bod Pod. Final measurements will be taken March 26-30 and a winning team named. "We really want to encourage Airmen to start off the New Year on the right foot by learning exactly where their body fat numbers are," said Christopher Woodruff, Schriever HAWC health promotions educator. "Body fat, when in reference to health, plays a big roll." The Bod Pod is a body composition test that uses air displacement to calculate body density and body fat. The measurements give those beginning a fitness regimen a baseline. People who exercise appropriately increase lean body mass while decreasing their overall fat level. Depending on the amount of fat loss, this can result in a loss of inches without a loss of weight, since muscle weighs more than fat. According to the President's Council on Fitness, Sports and Nutrition, a certain amount of body fat is necessary for everyone. Experts say that percent body fat for women should be about 20 percent and about 15 percent for men. Women with more than 30 percent body fat and men with more than 25 percent are considered obese. The Council also explains excess body fat has been linked to health problems such as coronary heart disease, high blood pressure, osteoporosis, diabetes, arthritis and certain forms of cancer. The HAWC won't leave potential competitors hanging. Throughout the three-month period of the competition, potential body-fat percentage busters can participate in a variety of classes offered by the HAWC and consult with HAWC staff members for more ways to safely cut fat. In the end, participants can expect better health due to decreased body fat percentage as well as prizes for the team who is able to cut the most fat. "Our prizes include awesome HAWC prizes and of course, increased years of life due to better health," said Woodruff. Potential teams should call the HAWC at 567-4292 to sign up. Dr. James Bender is a former Army psychologist who deployed to Iraq as the brigade psychologist for the 1st Cavalry Division’s 4th Brigade Combat Team out of Fort Hood, Texas. During his deployment, he traveled through Southern Iraq, from Basra to Baghdad. He writes a monthly post for the DCoE Blog on psychological health concerns related to deployment and being in the military. Around the holidays, especially heading into the new year, people tend to reflect on what they’ve accomplished and make resolutions to improve themselves or achieve certain goals. Many people set goals related to physical fitness: lose 10 pounds, bench press 300 pounds, or max out their physical fitness test. These are great goals that are worth pursuing, but what about goals related to improving your mental health? There are things you can do to improve your memory, mood and generally get psychologically fit. ■Good nutrition is important for your physical AND mental health. There’s a lot of evidence showing that omega-3 fatty acids and folate help the brain. Also, adopting a healthy diet in general supplies the brain with the nutrients needed to maintain the many complex chemical reactions the brain executes on a daily basis. ■Aerobic exercise isn’t only good for you physically; it’s great for your brain. Evidence shows it can lead to better cognitive performance, decrease age-related cognitive decline and lower stress. ■Get a professional opinion if you’re often feeling depressed, anxious or suspect you may have a psychological health condition. Treating mental health concerns will not only improve your quality of life, it will enhance your physical and mental performance. ■Give your brain a workout. Learning a new language, musical instrument or playing chess are all ways to improve concentration and sharpen the mind. ■Sleep is very important for memory and overall mental health. Your brain functions more efficiently when you get enough sleep. ■Be socially active and foster relationships. This tends to reduce stress, symptoms of anxiety and depression, and provide valuable support when you need it. By doing these things, you will go a long way toward improving your mental health and being psychologically fit. Find a few additional tips and resources to help you in this Real Warriors Campaign article. Keep in mind improving your mental fitness takes work and an active commitment—prioritize sleep, exercise and nutrition. But like any other worthwhile pursuit, the rewards are worth the effort. Stay safe and warm. And Happy New Year! 12/27/2011 - LOS ANGELES AIR FORCE BASE, El Segundo, Calif. -- The Air Force recently awarded a contract option to Boeing Space and Intelligence Systems to complete the acquisition of satellite 8 for the Wideband Global Satellite Communications program. The exercise of the contract option for production, valued at $296 million, brings the total cost of satellite 8, including long lead parts, to $354 million and ensures the continuation of critical wideband communications support to the warfighter. Satellite 8 is a part of the WGS Block II Follow-on contract that consists of options for satellites 7, 8, and 9. The Block II Follow-on satellites are being procured under a new, commercial-like operating model that has resulted in savings to the U.S. Government of more than $100 million without compromising mission assurance. These savings arise from streamlining processes, tests and governmental oversight functions commensurate with the maturity of the WGS production line. The production efforts for satellite 8 were initiated in August 2011 with the award of a contract modification valued at $58 million that began the long lead activities for the satellite. The acquisition of satellite 8 continues the production of WGS satellites which began in 2000. Satellites 1 through 3 are operational and in geosynchronous orbit providing wideband communications to warfighters around the globe. Satellite 4 is being readied for an anticipated January 2012 launch. Satellites 5 through 7 are currently in production. Wideband Global SATCOM provides anytime, anywhere communication for the warfighter through broadcast, multicast and point-to-point connections. WGS is the only system that can support simultaneous X- and Ka-band communications. The WGS crossbanding capability makes communicating across terminal types transparent to the warfighter. WGS currently collects and routes real-time data through more than 700 X-band, 3100 Ka-band and 400 X/Ka-band terminals in all theaters of operation. ARLINGTON, Va. (NNS) -- The Department of the Navy continues its move toward renewable energy with an Office of Naval Research (ONR)-funded solar generator that recently entered full production, officials announced Dec. 21. The Ground Renewable Expeditionary ENergy System (GREENS) is a portable, 300-watt, hybrid battery generator that uses the sun to produce electric currents. It was developed to provide Marines with continuous power in the field. "This item significantly reduces the amount of fuel that has to be delivered, minimizing the number of warfighters on the roads, convoys and hazards, as well as the logistics expenses associated with distributing fuel," said Cliff Anderson, logistics program officer in ONR's Expeditionary Maneuver Warfare & Combating Terrorism Department. "That was really the objective: to get warfighters out of harm's way and reduce the cost of transporting fuel." The system, which rapidly transitioned from ONR to Marine Corps Systems Command (MCSC) and then into production, provides Marines in remote locations with battery and plug-in power for charging various devices. Several small Marine Corps outposts have successfully used GREENS as their sole energy source. This is notable because transporting fuel to these remote locations is often challenging and expensive. "Infantry battalions that are far forward do not have immediate access to a wide range of logistics and maintenance equipment; therefore, any source of power that requires no [military-grade fuel], low maintenance and no special skills to operate becomes an instant success," said Maj. Sean Sadlier, a logistics analyst with the Marine Corps Expeditionary Energy Office, who trained users on and tested GREENS in the field with India Company, 3rd Battalion, 5th Marine Regiment. He added, "GREENS is modular, portable, rugged and intuitive enough to deploy in a combat environment. Units trained on GREENS as part of pre-deployment training have provided positive feedback." GREENS supports the Marine Corps' objective of generating all power needed for sustainment and command, control, communications, computers and intelligence equipment in place in the field by 2025. This vision, as laid out in the USMC Expeditionary Energy Strategy, aligns with the Marine Corps Vision and Strategy 2025. The goal is to enable Marines to travel more lightly and quickly by reducing the amount of fuel needed. Naval Surface Warfare Center Carderock Division developed and tested the GREENS prototypes. Naval Air Warfare Center Weapons Division at China Lake assessed the final prototype, subjecting it to continuous power testing in temperatures exceeding 116 degrees Fahrenheit. Even under these conditions, GREENS worked at 85 percent capacity. This result exceeded expectations and led to an MCSC request that the product be rapidly developed and readied for acquisition. ONR provides the science and technology necessary to maintain the Navy and Marine Corps' technological advantage. Through its affiliates, ONR is a leader in science and technology with engagement in 50 states, 30 countries, 1,035 institutions of higher learning and more than 900 industry partners. ONR employs approximately 1,065 people, comprising uniformed, civilian and contract personnel, with additional employees at the Naval Research Lab in Washington, D.C.
PASADENA, Calif. -- NASA will hold a media teleconference at 11 a.m. PST on Wednesday, Dec. 28, to preview twin spacecraft being placed in orbit around the moon on New Year's Eve and New Year's Day. NASA's twin lunar Gravity Recovery and Interior Laboratory (GRAIL) probes were launched from Cape Canaveral Air Force Station on Sept. 10, 2011. GRAIL-A is scheduled to arrive in lunar orbit beginning at 1:21 p.m. PST on Saturday, Dec. 31, and GRAIL-B on Sunday, Jan. 1, beginning at 2:05 p.m. PST. After confirmation they are in orbit and operating nominally, the two solar-powered spacecraft will fly in tandem orbits to answer longstanding questions about the moon and give scientists a better understanding of how Earth and other rocky planets in the solar system formed. - David Lehman, project manager, NASA's Jet Propulsion Laboratory (JPL), Pasadena, Calif.
To participate, reporters must contact the JPL Media Relations Office at 818-354-5011 by 10:30 a.m. PST on Dec. 28 for the call-in number and passcode. Audio of the teleconference will be streamed at http://www.nasa.gov/newsaudio. Supporting images will be available 15 minutes prior to the teleconference at http://1.usa.gov/grailnews. For more information about GRAIL visit http://www.nasa.gov/grail. The National Science Foundation (NSF) will be holding a workshop, "Science: Becoming the Messenger" on January 23, 2012, at the Waikiki Beach Marriott Resort & Spa Hotel, 2552 Kalakaua Avenue, Honolulu, Hawaii 96815. We are extending an invitation to principal investigators (PI), early career researchers and engineers, graduate students and postdocs from institutions and universities in Hawaii who would like to learn to communicate effectively to a broad audience. We are also extending an invitation to public information officers (PIO) communicating on behalf of the institutions and universities in Hawaii. Today, across academia and the research community, there is a growing interest in science communication. Scientists are asking how they can share their knowledge and findings across an increasingly challenging information environment. Seminars and training workshops are, accordingly, springing up to meet this need. But never before has there been a team like the one NSF has assembled to help members of the scientific community at all levels become more effective messengers. 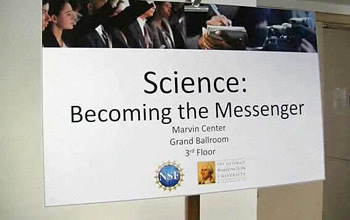 Featuring three accomplished communicators and trainers--Emmy award winning television producer Joe Schreiber, former PBS executive Dan Agan and bestselling science author Chris Mooney--the NSF workshop "Science: Becoming the Messenger" provides one-stop shopping for those seeking to reach a broader public about their work. Over the course of this full day of training, participants will learn how to craft a message and deliver it to a variety of audiences. They will also have the opportunity to experience live interview training, to develop writing and new media skills, to hone their public presentations and even to produce video. Public information officers (PIO) will participate in all aspects of day one of the workshop and be able to participate with the researchers. They will attend a special breakout session designed to collaborate with NSF Public Affairs. For a specially selected group of RESEARCHERS, there will be a second day on January 24, 2012. During this second day, they will refine their message further, train to talk to their colleagues, public audiences and the media. If you are interested in participating in the second day of the workshop and would like to be considered, please complete the questions on the registration form. If you are not interested or a PIO, simply type N/A in the box on the registration form. There is no registration fee to attend but pre-registration is required. Please complete the registration form. The registration deadline is January 13, 2012. PLEASE BE PREPARED TO ATTEND THE WORKSHOP FOR THE ENTIRE DAY SINCE THE SESSIONS BUILD ON ONE ANOTHER. IF YOU ARE CHOSEN FOR THE 2ND DAY, YOU MUST ALSO COMMIT TO STAY FOR THE ENTIRE DAY. Register for this event at http://www.nsf.gov/events/registrations_forms/index.cfm?wkshop_id=84&cntn_id=122653. Carla Voorhees is a web strategist supporting the Department of Defense, Defense Media Activity. This year, as Christmas Eve approaches, the Federal Aviation Administration (FAA) and the North American Aerospace Defense Command (NORAD) are ensuring that Santa One can take off, and will fly safely as Santa and his reindeer deliver presents all over the world. FAA safety inspectors have given the thumbs-up for the reindeer-powered sleigh known as Santa One to fly on Christmas Eve so Santa Claus can deliver presents to children around the world. The approval came after a thorough inspection of the aircraft at the North Pole. Special, gumdrop-enhanced avionics installed in Rudolph’s red nose will make it 10 times brighter, allowing the elves to track Santa One even during the type of heavy snowfall expected this Christmas. Elves in an air traffic control tower on the top of the North Pole will keep Santa One safely separated from other aircraft using Candy Cane Satellite Surveillance-Broadcast, an enhancement of the FAA’s satellite-based system called Automatic Dependent Surveillance-Broadcast. The faster routes are much better for the environment because the team of nine reindeer will consume fewer carrots this Christmas Eve. In the past, each of the nine reindeer has consumed an average of 24 pounds of carrots per hour during the 10-hour voyage, with Rudolph consuming 28 to 30 pounds. The improved efficiency means reindeer will consume 1,080 fewer pounds of carrots this year. The trickle-down effect is expected to benefit the Easter Bunny. The FAA has more information about how NextGen is helping Santa deliver toys at the Santa One Story. The website features fun and interactive information on the different ways Santa is benefitting from NextGen, educational puzzles, Santa’s approved flight plan and a link to track his Christmas Eve voyage. NORAD will of course be tracking Santa, using radar, satellites, Santa cams and fighter jets. Tracking Santa starts with the NORAD radar system called the North Warning System. This powerful radar system consists of 47 installations strung across the northern border of North America. On December 24th, NORAD monitors the radar systems continuously for indications that Santa Claus has left the North Pole. Canadian NORAD fighter pilots flying the CF-18 intercept and welcome Santa to North America. In the United States, American NORAD fighter pilots in either the F-15, F-16 or the F-22 get the thrill of flying alongside Santa and his famous reindeer: Dasher, Dancer, Prancer, Vixen, Comet, Cupid, Donner, Blitzen and, of course, Rudolph. Once data is collected on December 24th, it is then pushed into the Google Maps and Google Earth so that families all over the world can also follow Santa. You can also follow NORAD as they track Santa on your mobile phone using iOS and Android apps, Twitter, Facebook, and Google+. HOUSTON -- International Space Station Commander Dan Burbank captured spectacular imagery of Comet Lovejoy, viewed from about 240 miles above the Earth’s horizon on Wednesday, Dec. 21. Today Burbank described seeing the comet as “the most amazing thing I have ever seen in space,” in an interview with WDIV-TV in Detroit. Burbank took hundreds of still images of the comet. The images also were processed into a time-lapse video that will air on NASA TV at 4 p.m. CST. The video, including Burbank’s comments, and a selection of the individual images are available online at http://www.nasa.gov/station. For additional images and information on Comet Lovejoy, visit http://www.nasa.gov/sunearth. Langley Research Center, Hampton, Va.
WASHINGTON -- NASA has selected Airborne Systems North America of Santa Ana, Calif., ILC Dover LP of Frederica, Del., and Lockheed Martin Space Systems Company of Littleton, Colo., to support agency inflatable aerodynamic decelerator research and development, including work on the Space Technology Program's Hypersonic Inflatable Aerodynamic Decelerator (HIAD) project. Inflatable aerodynamic decelerators are lightweight outer shells that slow and protect spacecraft as they enter planetary atmospheres. This technology allows increased payload mass, makes it possible to reach higher surface elevations for robotic and human exploration of solar system destinations, and improves cargo return capabilities from the International Space Station. Contractors will provide NASA with services for the design, analysis, fabrication and testing of project systems, including the thermal protection system and inflatable structures for aerocapture and direct entry applications. The cost-plus-fixed-fee, indefinite-delivery, indefinite-quantity task order contracts have a maximum cumulative agency value of $47 million over a five-year performance period. NASA's Langley Research Center in Hampton, Va., will administer the contracts for the agency. For more information about NASA and agency programs, visit http://www.nasa.gov. Defense Centers of Excellence for Psychological Health and Traumatic Brain Injury (DCoE) hosted the fourth annual Trauma Spectrum Conference at the National Institutes of Health (NIH) in Bethesda, Md., Dec. 8-9. The conference brought together top minds from DCoE, NIH, Department of Veterans Affairs (VA), health care providers and military health care advocates to discuss a key issue: how to bridge the gap between clinical research and military systems of care for psychological health and traumatic brain injury (TBI). “This is an important conference because we have a lot of creative people out in the world doing excellent work,” said Navy Capt. Paul S. Hammer, DCoE director, who gave opening remarks. He stressed the need to provide greater care to wounded warriors by translating information from the research world into clinical reality, and reminded the audience of the importance of keeping the patient at the center of what they do every day. Keynote speaker Dr. Ramon Diaz-Arrastia, Center for Neuroscience and Regenerative Medicine, Uniformed Services University for the Health Sciences, outlined the modern epidemiology of TBI and gave an overview of TBI in the military and modern battlefield. He discussed diffusion-tensor imaging, an advanced technique that scans white matter in the brain. The technique is valuable because it can help clinicians diagnose a TBI months after the trauma. Technology to improve diagnosis and treatment became a focal point of the conference, as new imaging techniques and technology from National Center of Telehealth and Technology (T2) were presented. Dr. Greg Gahm, T2 director, took the audience on a virtual tour of the center’s mobile applications, websites, telehealth units and the future of its efforts to help service members manage care. He praised suicideoutreach.org and afterdeployment.org as key resources for improving military psychological health care and noted the success of the popular Mood Tracker mobile application. He also discussed the use of virtual worlds for treatment, including demonstrating the T2 Virtual PTSD Experience, which provides information about PTSD causes, symptoms and resources for care. “We at T2 believe the best way to predict the future is to create it, and we will continue to do that,” Gahm said. Dr. Anthony Panettiere, a neurology and sleep physician at National Intrepid Center of Excellence, talked about sleep concerns. The center treats service members with post-combat sleep disorders in its sleep lab. “Most troops do not look forward to going to bed,” he said as he discussed ways the center treats a service member with wartime experiences that turn into nightmares. “We have a patient take a dream or nightmare they’re having, write it down and then [encourage them to] change the beginning or the end to something less emotional,” said Panettiere. Afternoon workshops provided attendees with opportunities to gain more information and resources and ask questions about psychological health topics such as co-occurring disorders, cognitive rehabilitation, substance use disorders, among other subjects. Day one of the conference ended with encouragement for attendees to embrace what they learned to help improve the system of military health care. With the holiday season in full swing, a new image from an assembly of telescopes reveals a pulsar that appears like a spinning cosmic ornament. Combined data from NASA's Chandra X-ray Observatory and ESA's XMM-Newton were used in the discovery of a young pulsar in the remains of a supernova located in the Small Magellanic Cloud, or SMC. This is the first time a pulsar, which is a spinning, ultra-dense star, has been found in a supernova remnant in the SMC, a small satellite galaxy to the Milky Way. In this composite image, X-rays from Chandra and XMM-Newton have been colored blue and optical data from the Cerro Tololo Inter-American Observatory in Chile are colored red and green. 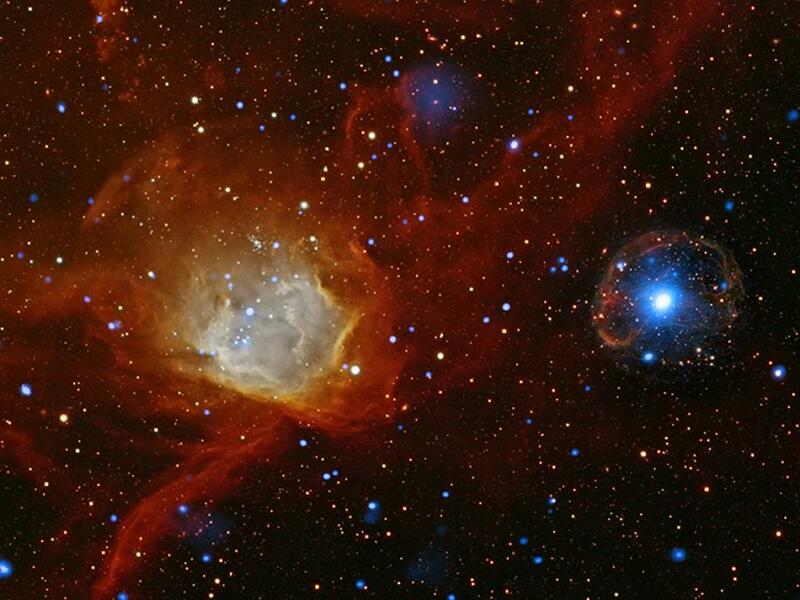 The pulsar, known as SXP 1062, is the bright white source located on the right-hand side of the image in the middle of the diffuse blue emission inside a red shell. The diffuse X-rays and optical shell are both evidence of a supernova remnant surrounding the pulsar. The optical data also displays spectacular formations of gas and dust in a star-forming region on the left side of the image. SXP 1062 interests astronomers because the Chandra and XMM-Newton data show that it is rotating unusually slowly -- about once every 18 minutes. (In contrast, some pulsars are found to revolve multiple times per second, including most newly born pulsars.) This relatively leisurely pace of SXP 1062 makes it one of the slowest rotating X-ray pulsars in the SMC. Scientists have estimated that the supernova remnant around SXP 1062 is between 10,000 and 40,000 years old, as it appears in the image. This means that the pulsar is very young, from an astronomical perspective, since it was presumably formed in the same explosion that produced the supernova remnant. Therefore, assuming that it was born with rapid spin, it is a mystery why SXP 1062 has been able to slow down by so much, so quickly. Work has already begun on theoretical models to understand the evolution of this unusual object. Image Credit: NASA/CXC/Univ. of Potsdam/L. Oskinova et al. Nevada, the "Silver State," is well-known for mining precious metals. But scientists Dennis Bazylinski and colleagues at the University of Nevada Las Vegas (UNLV) do a different type of mining. They sluice through every water body they can find, looking for new forms of microbial magnetism. In a basin named Badwater on the edge of Death Valley National Park, Bazylinski and researcher Christopher Lefèvre hit pay dirt. Lefèvre is with the French National Center of Scientific Research and University of Aix-Marseille II. In this week's issue of the journal Science, Bazylinski, Lefèvre and others report that they identified, isolated and grew a new type of magnetic bacteria that could lead to novel biotech and nanotech uses. Magnetotactic bacteria are simple, single-celled organisms that are found in almost all bodies of water. As their name suggests, they orient and navigate along magnetic fields like miniature swimming compass needles. This is due to the nano-sized crystals of the minerals magnetite or greigite they produce. The presence of these magnetic crystals makes the bacteria and their internal crystals--called magnetosomes--useful in drug delivery and medical imaging. The research was funded by the U.S. National Science Foundation (NSF), the U.S. Department of Energy and the French Foundation for Medical Research. "The finding is significant in showing that this bacterium has specific genes to synthesize magnetite and greigite, and that the proportion of these magnetosomes varies with the chemistry of the environment," said Enriqueta Barrera, program director in NSF's Division of Earth Sciences. While many magnetite-producing bacteria can be grown and easily studied, Bazylinski and his team were the first to cultivate a greigite-producing species. Greigite is an iron sulfide mineral, the equivalent of the iron oxide magnetite. "Because greigite-producing bacteria have never been isolated, the crystals haven't been tested for the types of biomedical and other applications that currently use magnetite," said Bazylinski. "Greigite is an iron sulfide that may be superior to magnetite in some applications due to its slightly different physical and magnetic properties. Now we have the opportunity to find out." 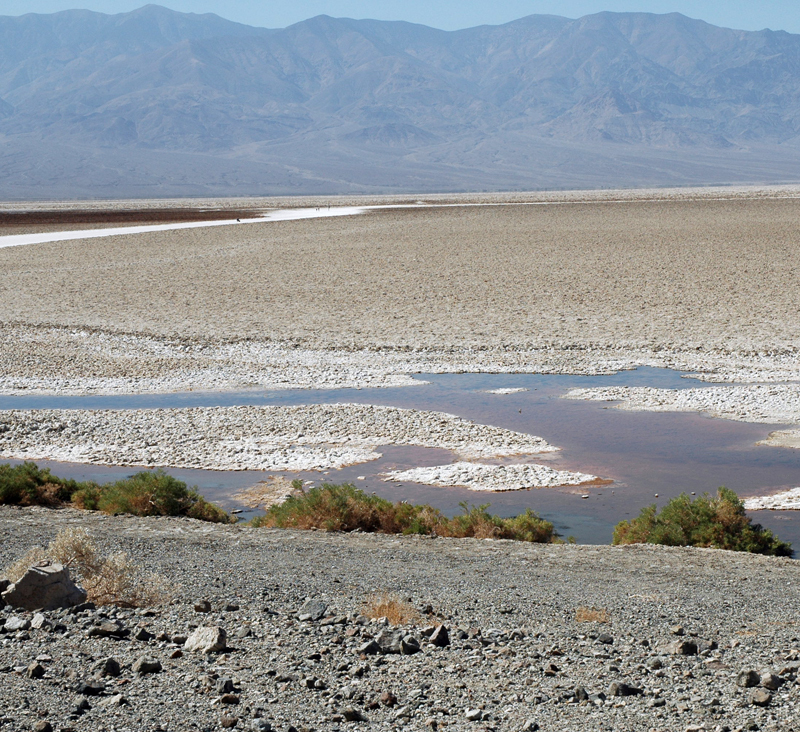 Researchers found the greigite-producing bacterium, called BW-1, in water samples collected more than 280 feet below sea level in Badwater Basin. Lefèvre and Bazylinski later isolated and grew it leading to the discovery that BW-1 produces both greigite and magnetite. A detailed look at its DNA revealed that BW-1 has two sets of magnetosome genes, unlike other such bacteria, which produce only one mineral and have only one set of magnetosome genes. This suggests that the production of magnetite and greigite in BW-1 is likely controlled by separate sets of genes. That could be important in the mass production of either mineral for specific applications. According to Bazylinski, the greigite-producing bacteria represent a new, previously unrecognized group of sulfate-reducing bacteria that "breathe" the compound sulfate rather than oxygen as most living organisms do. "With how much is known about sulfate-reducing bacteria, it's surprising that no one has described this group," he said. Working with Bazylinski and Lefèvre on the project are David Pignol of the French National Center of Scientific Research and University of Aix-Marseille II; Nicolas Menguy of Pierre and Marie Curie University, France; Fernanda Abreu and Ulysses Lins of the Federal University of Rio de Janeiro, Brazil; Mihaly Pósfai of the University of Pannonia, Hungary; Tanya Prozorov of Ames Laboratory, Iowa; and Richard Frankel of California Polytechnic State University, San Luis Obispo. Scientists have successfully transitioned fundamental research in autonomy to undersea gliders, demonstrating in recent sea tests how the new software, sponsored by the Office of Naval Research (ONR), can help robots become smarter at surveying large swaths of ocean. “Using the new algorithms, the vehicle has a greater ability to make its own decisions without requiring a human in the loop,” said Marc Steinberg, program officer for ONR’s Adaptive Networks for Threat and Intrusion Detection or Termination (ANTIDOTE), a multi-disciplinary university research program. With plans to deploy squadrons of air, surface and undersea robotic vehicles later this decade, the Department of the Navy is investing in basic research programs to improve autonomous system capabilities. ONR provided funding to researchers at the Massachusetts Institute of Technology (MIT) and University of Southern California (USC) to advance the intelligence of autonomous vehicles under both ANTIDOTE and a related university program called Smart Adaptive Reliable Teams for Persistent Surveillance. They developed a persistent surveillance theory that provides a framework for decision-making software that maximizes a robot’s collection of information over a given area. It gives some guarantees on performance in dynamic environments. The scientists produced an algorithm that incorporates both the user’s sensing priorities and environmental factors, such as ocean currents, into a computer model to help undersea robots conduct surveys and mapping missions more efficiently. Tests proved the benefits of using the new algorithm. The scientists conducted two separate experiments using underwater robots called gliders, operated by oceanographers. They used two gliders, one with the algorithm and one without, to measure whether the experimental technology yielded better maps of algae blooms and other underwater phenomena in the Pacific Ocean. The algorithm helps the gliders decide when to spend more time looking at regions that have changes in activity or environmental factors. Without the control algorithm, gliders paid equal attention to all areas and acquired less information during the experiments in Monterey Bay, Calif., and along the southern coastal waters near Los Angeles in October and November 2010. The first experiment lasted a period of three weeks; the second ran for two weeks. A third experiment in August 2011 took place in the Southern California Bight for 10 days. Results of the single-glider test are being analyzed. Though the gliders were an ideal first test of the persistent surveillance theory and algorithm, the software is applicable to many different machines and robots, the scientists said. The Department of the Navy’s Office of Naval Research (ONR) provides the science and technology necessary to maintain the Navy and Marine Corps’ technological advantage. Through its affiliates, ONR is a leader in science and technology with engagement in 50 states, 70 countries, 1,035 institutions of higher learning and 914 industry partners. ONR employs approximately 1,400 people, comprising uniformed, civilian and contract personnel, with additional employees at the Naval Research Lab in Washington, D.C.